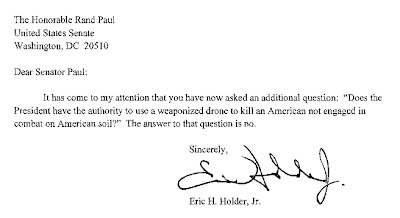 Attorney General Holder sent this letter to Sen. Rand Paul. Now the question is, how do you define an American engaged in combat on American soil? 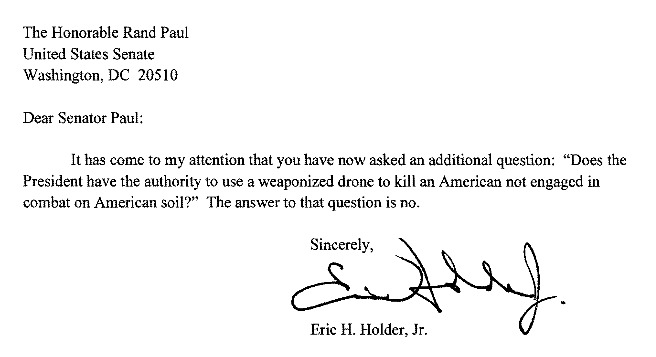 Holder hasn't rejected Pelosi's bigoted definitions of who the President may kill or her definition of imminent. Worse, Pelosi's statement that President has the Constitutional power to keep his killings of Americans secret--to disappear them--appears to be the stance of both the Democratic Party and this administration. Obama may have already disappeared Americans abroad. Finally, it is unclear what decision-making process exists for drones, or if corporations can be part if the decision-making or execution process. Obama illegally included banks in discussions on how to shut down the legal and domestic Occupy movement. Can that be the case with drones and killing? Can a Xe decide wo lives and dies? Can a Wall Street banker? Who, exactly, by name and position, is on this real death panel? Please excuse the source but I find their logic reasonable on this topic. I really don't understand why more democrats didn't stand up with Rand Paul on this issue.